As a firm of professionals with expertise in business consultancy and immigration law, DLI offers clients a comprehensive and bespoke service catering for those seeking business planning assistance to accompany US visa applications and petitions. Business plans play a paramount and central role in the adjudication of most business visa applications and petitions; they are a common cause of success or failure. You may require a business plan and in any event will benefit from one. Our firm is innovative in developing solutions whilst engaging and supporting clients at each stage of the process. We serve a wide and varied clientele, and every client relationship is equally valued. Each engagement benefits from the depth and breadth of our expertise. Do you have the time to create a strong and persuasive business plan? Do you have the experience, specialist insight and resources to compose a plan that covers all immigration considerations while painting your business in the best light? Depend on DLI to enhance your application and persuade the immigration officer of your vision and goals. By relying on DLI’s lawyers, academics, market researchers, accountants and business owners, you will be given the best chances of success. Applications can be refused with no right of appeal and in today’s rapidly changing immigration environment errors can lead to costly, and time-consuming and consequential re-submissions. Can you take this risk? DLI has international experience advising businesses in wide ranging markets including the USA, China, Europe and Russia. The team has over 20 years’ collective experience writing business plans and for the past several years, business plans specifically for immigration purposes. Over the years the team has developed plans for applicants working within industries including but not limited to: construction, aviation, tourism, livery, real estate, IT and software, furniture, marketing, professional services, venture capitalist, hospitality and the food and beverage industry. With strong academics, business experience and understanding of immigration law, we are able to leave no stone unturned. The whole team is highly qualified and features on the website. Our fees are fixed and you are apprised at the outset. The team has extensive experience working in diverse roles and industries across continents and consists of lawyers, academics, and professionals. Each member of our team holds a set of skills that complements the other, allowing us to offer a comprehensive and robust service. Deadlines are agreed at the outset and adhered to. In today’s rapid changing immigration environment, Davies Legal is able to conclude a business plan ready for submission in a time frame to meet all clients’ needs. Our clients describe our team as being “super committed and transparent”, with an “eye for detail, understanding and patience”. Our clients say that our team offers a “very professional service in a personable and friendly manner” and our “knowledge and willingness to go the extra mile …ensured …no further information or documents [were] requested by authorities.” Clients have commended our “quick service, knowledge and humour throughout the process”. The team provides a competent, diligent and ethical service at all times. All communications are confidential and shall not be shared with third parties. We are data protection registered and compliant. Why an Immigration BP Writer? Nationality No specific requirements Nationality of a company and its owners can be central. It is particularly determinative in Treaty applications. Premises No specific requirements When it comes to new office L-1 visas, this can make or break your application. In a number of applications, the suitability of premises must be considered. Investment No specific requirements Unlike simply showing the business is viable, the level of investment in immigration business plans varies depending on visa type, embassy and business type. Staff No specific requirements This is generally considered more important in the case of immigration business plans. Roles, salaries and number of staff will be considered. Profitability No specific requirements These projections must be realistic and independently based. Existing clients or contracts add greater support. Business strategy No specific requirements Must fit in line with requirements. Sale of membership interests or shares must be within the bounds of the Regulations. Renewal should be considered. 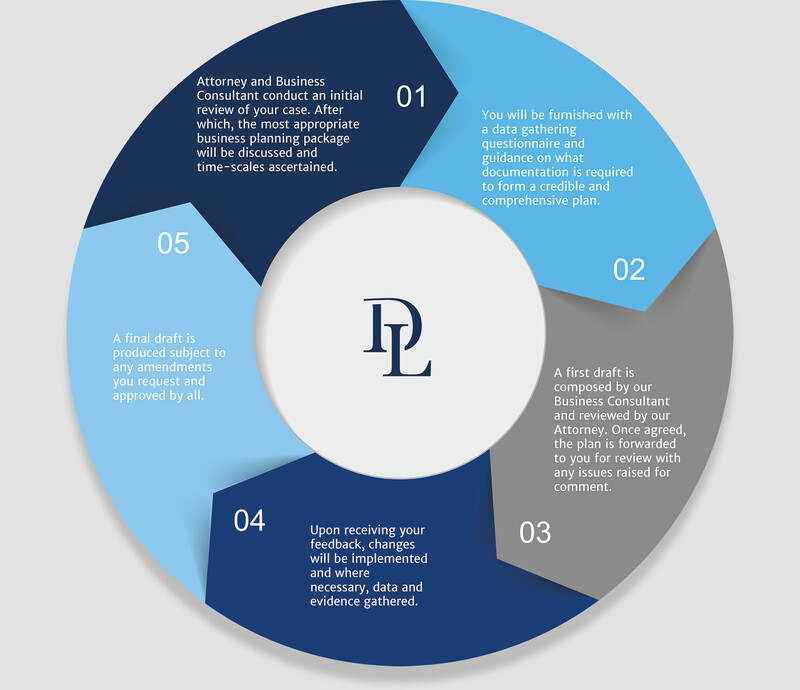 A comprehensive business plan as contemplated by the regulations should contain, at a minimum, a description of the business, its products and/or services, and its objectives. The plan should contain a market analysis, including the names of competing businesses and their relative strengths and weaknesses, a comparison of the competition’s products and pricing structures, and a description of the target market/ prospective customers of the new commercial enterprise. The plan should list the required permits and licenses obtained. If applicable, it should describe the manufacturing or production process, the materials required, and the supply sources. The plan should detail any contracts executed for the supply of materials and/or the distribution of products. It should discuss the marketing strategy of the business, including pricing, advertising, and servicing. The plan should set forth the business’ organizational structure and its personnel’s experience. It should explain the business’ staffing requirements and contain a timetable for hiring, as well as job descriptions for all positions. It should contain sales, cost, and income projections based on substantiated evidence. Most importantly, the business plan must be credible. all aspects of the standard package with the requisite/desirable verification by a United States Certified Public Accountant (“CPA”). Upon production of an approved final draft of your tailored business plan, it will be reviewed by our CPA who produces a taxation summary and verifies the forecasts in line with specialist research to demonstrate the authenticity of the projections and the benefits to the US economy. This service will provide you with Embassy- mandated figures and taxation verification, and in efforts to provide a truly premium service, the veracity of your plan will also be CPA-verified. This comprehensive review–by your business consultant, lawyer and CPA–will identify strengths and weaknesses, and with your cooperation ensure that your business plan provides you with the best chances of success. Fees are dependent upon package, visa category, business complexity and time-scale.We offer highly competitive rates and are dedicated to our clients’ success. Please call 020 7856 0395 or email info@davieslegal.com for a no obligation quote. Talk to our expert team about business plan services.